Guest Faculty at UOH. University of Hyderabad Guest Faculty 2018 Recruitment: University of Hyderabad invites applications for Guest Faculty positions in Department of Fine Arts invites applications for the following Guest Faculty positions on temporary basis. University of Hyderabad Guest Faculty 2018 Recruitment (Issued on December 14, 2018): University of Hyderabad has given the Guest Faculty Recruitment and last date to apply is 26.12.2018. University of Hyderabad, Department of Fine Arts invites applications for the following Guest Faculty positions on temporary basis. Qualification: MFA in Art History with NET qualification, MFA in Printmaking/ Sculpture. How to apply: Candidates send their applications with comprehensive CV with proof of the Documents to The Head, Department of Fine Arts, Prof. C.R. Rao Road, Gachibowli, Hyderabad. University of Hyderabad is inviting applications for the post Guest Faculty in the Centre for Women's Studies. This recruitment is purely on temporary basis for one semester. Selected candidates can earn Rs. 20,000-30,000/- as monthly salary. Students having MA and PHD Degree are eligible to apply for this recruitment. 1. Good academic record with at least 55% of the marks or an equivalent grade of B in the 7 point scale with letter grade O, A, B, C, D, E & F at the Master’s degree level in the relevant subject i.e. M.A. in respective foreign language from an Indian University or an equivalent degree from an accredited foreign University. 2. Candidates should have cleared Eligibility Test (NET) for Lecturers conducted by UGC/ CSIR or similar test accredited by the UGC wherever it is applicable. The candidates who are, or have been awarded a Ph.D. Degree in accordance with the UGC Regulations, 2009, shall be exempted from NET. How to Apply: Applicants should send their details in the prescribed format through email or by post or in person which must be accompanied by attested copies of certificates in support of all information furnished in the form to the following address. Address: The Head, Centre for Study of Foreign Languages, Old Life Science Building, University of Hyderabad, P.O. Central University, Prof. C.R. Rao Road, Gachibowli, Hyderabad. Last date for the receipt of applications: 02.06.2017. Medical Guest Faculty -University of Hyderabad, School of Medical Sciences invites applications for the following position on Guest Faculty (Temporary) basis. Qualification: MD/ MS/ M.Sc. (Optometry)/ LLB/ MPhil/ Ph.D. (Optometry) with a minimum of 55% aggregate marks. Min. 3 years experience in teaching and clinical training. Applications: The applications along with a copy of curriculum vitae with details of academic qualifications, work experience and copies for certificates in support of qualifications and experience should be sent on or before 16.12.2016. Address: Prof. Geeta K. Vemuganti, Dean, School of Medical Sciences, Prof. C.R.Rao Road, Gachibowli, University of Hyderabad, Hyderabad. Guest Faculty-UOH/University of Hyderabad Guest Faculty 2016 : Centre for English Language Studies, University of Hyderabad invites applications for appointment as Guest Faculty for teaching at the Centre for Integrated Studies and the M.Tech/ MCA programmes. Qualification: M.A. in English with a minimum of 55% marks and NET/ JRF. Or M.A. in any area of English language studies with a minimum of 55% marks and NET/ JRF. Or Ph.D in English Language Studies/ English Linguistics. How to apply: Candidates can send their applications by post along with photocopies of their testimonials on or before 28.11.2016 to the Head, Centre for English Language Studies, Old Life Science Block, wing 4, University of Hyderabad, Dr. C.R. Rao Road, Gachibowli, Hyderabad. 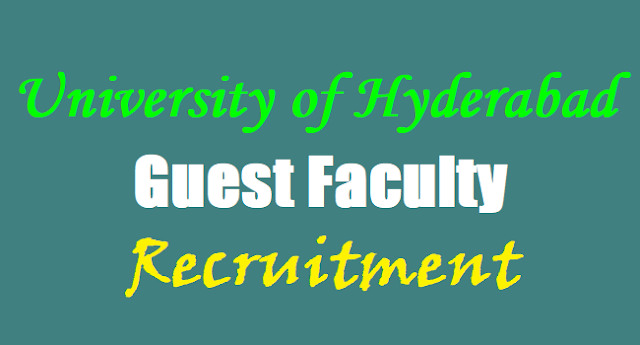 Guest Faculty-UOH/University of Hyderabad Guest Faculty 2016: Department of Fine Arts is inviting the applications for the following Guest Faculty positions to teach the courses in the running semester from January to April 2016. Qualification: Masters Degree in Sculpture/ Print Making/ Painting (MFA)/ MFA in Art History with NET and research experience. How to Apply: Candidates are requested to send their applications with comprehensive CV with proof of the Documents, the ten photographs of their recent works and an idea of course and lesson plan, to The Head, Department of Fine Arts, Prof. C.R. Rao Road, Gachibowli, Hyderabad by 11.01.2016.